Marmaris holiday destination should be the next? Marmaris is a town in Turkey, along the Mediterranean coast in the region of Mugla. Though the town has close to 28,000 inhabitants, the population can increase to 250,000 during the tourist season. There are tons of exciting activities to enjoy during your Marmaris holiday. Some of the things that will fascinate you include great beaches, a variety of bars and restaurants, and lots of shopping with incredible bargains. Marmaris has a vibrant nightlife with a street dedicated to dance music and clubbing. With its vast outdoor dance venues, Bar Street offers the best of clubbing experience and will appeal to the most discerning clubbers. Marmaris holiday is also great for some family vacation. Exciting and affordable excursions like boat trips can take you round the bay and to nearby towns like Turunc and Icmeler. Marmaris boasts of two water parks, and local travel agents provide trips to Ephesus, Fethiye, Dalyan, Pamukkale and other well-known locations in Western Turkey. A trip to the harbor area of Marmaris reveals that the town is not merely for the package holidaymaker. There you will find those who can spend as much as $1000 on a pair of sunglasses as well as ocean going yachts valued at $10 million. 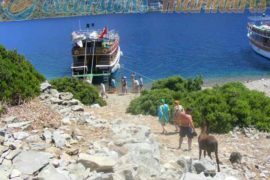 You can easily get a daily cruise to take you around the ruins of ancient cities, steep shoreline, turquoise coves and a cave surrounding Marmaris. All you need to do is take one of the yachts stationed along the waterfront of the city center which can accommodate up to 20 passengers. For your convenience and pleasure, take a tour plying the bay in an anticlockwise direction. Make sure you book a seat at least one day to the tour not to risk this butifull day of your Marmaris holiday. Jeep Safari– To visit the villages, beaches, waterfalls and mountains surrounding Marmaris. Turkish Bath–Also known as Hamam, this is a traditional Turkish bath with body peel, sauna, foam, and oil massage. Turkish Night –This is a night of awesome entertainment where a variety of traditional Turkish food is the main menu. One of the highlights of the night is dancing. You will love the belly dancers. Additionally, trips to Dalyan turtle beach and mud baths, Lycia,Ephesus, Pamukkale are also available. There are many shops in Marmaris that sell the usual tourist fodder and local specialties like carpets and Turkish delights. Fake and inexpensive designer clothes are quite common in the market, but the quality can be surprisingly impressive. You can also find original leather at a good price. Many establishments especially restaurants will accept international currencies such as Pounds, Dollars, and Euros. You will get a discount for your purchase when you spend over the specific amount. There are several supermarkets in Marmaris where you can buy different brands of food at lower prices if you decide not to eat out. For drinks, the local beer called Efes is served everywhere. Ayran is another drink worth giving a try. It is both refreshing and nutritious. Remember however to shake properly since the yogurt usually settles at the bottom. You can also find foreign beers like Becks, Fosters or Budweiser in some restaurants, but they are quite expensive. Wine is sold at an exorbitant price and seems to be all local. Tang is another drink you will relish. An alternative to fruit juice many hotels in Marmaris provides this drink for their guests. It is manufactured by Kraft and comes in sachets. Marmaris is known for its exciting nightlife. Many small bars located along the beachfront offer the ideal spot to watch the warm sunset. Bar street is home to over 100 clubs and bars ranging from club arenas to rock bars. All clubs and bars are open until at least 4 am. However, beware when hitting the bottles at Bar street as they are more expensive than those at Beachfront. Entry to most clubs are without charge, and sometimes special offers are available. Shortly its something for everyone while they are in Marmaris holiday. There are many hotels to choose from in Marmaris. Before you make reservations, it is advisable to check online for hotels and the services they offer. Choose a hotel that suits you. All inclusive deals are excellent value but look out for bed, breakfast and half board since some hotels may not allow you bring in food and drinks into their buildings. This would mean depending on their provisions which will not be cost effective. In self-catering properties, ensure that you handle furnishings and appliances with care as you will be charged for damages. High-speed hydrofoils and ferries leave for Rhodes and Greece several times on a daily basis from Marmaris. While on your Marmaris holiday, you can seize the opportunity to visit another country and check out its culture. Marmaris enjoys superb temperature from may to October, and long summers. It makes it the right destination if you’re looking sea, sun, and sand. Whether you are an explorer, culture vulture, party freak, or you only want to have fun with your family, Marmaris holiday offers a variety of mind-blowing activities to keep you engaged and entertained. The water sports, boat trips, side trips, and cuisines make Marmaris the place to spend your next holiday. Boat trips in Marmaris has helped this destination to became one of the best tourist destinations in the world. This Mediterranean resort town is on the Turquoise Coast, which has a busy beach and seafront pathway. The fact that is located between the clear waters and pine-forested mountains has made is a great land to explore. It is a small paradise on its own and has so many activities that it can offer. Taking a Marmaris boat trip is one of the key attractions for the thousands of holidaymakers that come to this town. There are so many other activities that you can do and enjoy your vacation in Marmaris. For those who would love to explore the destination in great details, boat trips would be the best option. Taking a Dalyan boat trip will help you appreciate the beauty of the clear waters in this region. The main advantage of the various boat trips is the fact that you can have other activities like a diving trip or even fishing. So when you take the Aegean boat trip, you should include more activities, which will make the excursion worthwhile. You can get guided tours, which will make your Kleopatra boat trip worthwhile. We have an experienced team that will help you achieve your dream of a perfect holiday. We will organise relaxing and fulfilling boat trips, and we can include so many other activities to make it all-inclusive. Have you ever considered taking a Rhodes Island trip? Well, this is the perfect opportunity, and with the inclusion of fishing and other water sports, you will want to repeat this, a number of times. If this is the first time to be in Marmaris, you will definitely need to take a Marmaris boat trip to all the popular bays. We also have exclusive spots, where we will take breaks, and you can choose to go for snorkelling or swimming. The only way that the Marmaris boat trip will not happen is if the weather is snowy. However, on a perfect sunny day, you can take a diving trip coupled with sessions of sunbathing. Our boating trips will also include fun activities at the local villages and also taking a break to walk on the shores so as to enjoy the breeze on the beach and walking on the sand. This would not be complete without boarding the famous Pirate ship in Marmaris. As long as you have landed in Marmaris, there are so many activities to do, and you can never get bored. Everything works to your advantage, and this will defiantly be a perfect holiday. If you are planning to come to this resort town, you should include a Marmaris boat trip in your itinerary. Now, the truth is that there are quite a lot of good ways to spend your vacation during the summer. However, there is nothing that can match the relaxation of a great boat trip off the pristine and golden beaches of Turkey. Icmeler is one of the greatest destinations if you are going to be doing so and booking an Icmeler boat trip could be a worthwhile decision. The quiet resort town is located at the western tip of the Gulf of Marmaris. It is where the Aegean Sea meets the Mediterranean Sea. It got its name from the various drinking water sources that are known to be good for the digestive system. While in Turunc you can enjoy one of the most amazing trips. Take an all inclusive Turunc boat trip with shuttle services from your hotel and back. Besides swimming, drinks, and lunch, you make stops in various places such as Aquarium Bay, Phosphorous caves, Fish Bay, Paradise Island and Kumbuluk Bay. Make it unforgatable whilist you are enjoying a lovely holiday in Marmaris. Every so often, your ship’s captain will drop anchor at some of the region’s prettiest spots. Plunge into the azure depths for a quick swim or even grab some snorkelling gear and go off to explore the colourful creatures that keep Medeteranian marine life abuzz. One unique factor of your Dalyan boat trip is that you enjoy the famous thermal mud baths. You also get a chance to see the loggerhead sea turtle at the Iztuzu which is also unique. Here you witness a rare beach that has fresh and salty water that do not mix. This is also home of ancient kingdom of Caunos . According to mythology Kaunos was founded by King Kaunos, son of the Carian King Miletus and Kyane, and grandson of Apollo. The south of Dalyan on the Mediterranean coast, lies (Iztuzu) Dalyan Turtle Beach, near the village of the same name is a popular area for sunbathing and swimming. There are regular boat and minibus services to the beach. Enjoy spectacular views along the way as you head to Cleopatra Island. Its name is derived from the myth that Cleopatra received the island from Antony. Enjoy a Kleopatra boat trip for amazing views of the surrounding with a fully insured trip. You will have a knowledgeable English speaking guide, with lunch and drinks as well as entrance fee to Cleopatra’s Island. Each grain of sand is a perfect sphere, for this reason the beach is heavily protected by the government to prevent any sand being removed from the beach. According to legend, Anthony and Cleopatra swam here and the sands were brought by ships from North Africa. Sail away in the Hisaronu Bay during your Agean boat trip. Learn about the ancient Greek monasteries from an English speaking crew. Interesting places are Inbuku, Semiliye, and Turgut Bays. The bay is only 30 min away travelling by bus first and then getting on a double wooden decker. Enjoy the the sun beats from that Egean side of Marmaris. This is where Greek mitology was born. If you are into sea tourism and appreciate nature, you should make a point of visiting Aegean Island which is located in Hisaronu Bay . Here you will get to enjoy the quietness of the secluded islands, and it takes you away from the busy life of Marmaris Peninsula. There is no better experience like going on a trip on the pirate ship. It is the largest in Europe with the personnel dressed as pirates. The little ones will love animation; there is an open buffet and unlimited drinks. The ship is well equipped, and everyone will love being aboard. Later on the day there are entertainment prepared especially for kids. The main one is the treasure finding. There are tons of different rooms both inside and outside the Barbossa Pirate Ship. On the deck of the ship, visitors can sunbathe, and there are also sofas and tables that will provide you an opportunity to relax. Water, baileys, soft drinks, vodka, and beers are overflowing. The staffs are also conducting party games that will keeps the kids happy. If you love fishing or you would like to give it a try, it will be an amazing experience. The best thing with fishing trips is that you are assured of seeing your catch with the fish finder computers equipped boats. You can opt for a morning or an evening fishing trip. The guide and the captain will take you to the most rewarding areas. Its the right time to satisy your hunting instincts and maybe get the biggest trophey of your lifetime. The actual trip is half a day once in the morning and once in the afternoon but you can always rent a boat for a whole day for your own if you wish. Rhodes Island trip, you will learn history worth thousands of years back. You get a golden opportunity to take numerous boat trips and go fishing as you discover the beautiful Mediterranean coast line. You have knowledgeable guides, and throughout your boat trip, you are in safe hands with lunch, soft drinks, wine and transport offered during your tour. This is another thing that you need to take into account. Now, even though it’s true that Turkey is an overly popular tourist attraction, it’s also true that not all of the crew members might be able to speak English. And, if there is one thing that you should dislike, that’s the language barrier. As such, it’s important to check whether the crew speaks English in advance. The last thing that you would want on your boat trip is to end up hungry and thirsty mid-day. This is absolutely devastating, and it’s going to ruin your trip incredibly quickly. You need to make sure that the trip has lunch included as well as common soft drinks, wine, and refreshing beer. This is definitely going to help you through the day and enable you to truly enjoy your trip. Places to See and Visit in Marmaris are endless. People are often lost when it comes to tourism destinations because they want to pack many activities and site visits in the same trip. This helps to see an area of the world, albeit not exhaustively. It also helps to maximise on the airfare and the hotel booking that one has to pay for during the trip. While some areas have fewer activities, others are laden with so many things to do that you cannot exhaust them all. Turkey is one of these places. Marmaris water parks are some of the resort’s main attraction. While different hotels have smaller water parks, the great attraction comes from the major water parks. Aqua Dream Water Park is the largest in Marmaris. It is located in Armutalan district and has so many activities for people of all ages. There are different slides, an aqua tower, a black hole, kamikaze slides, rafting slides, a wave pool, bars, and restaurants. Atlantis Water Park, the most popular attraction especially with children and teenagers, also offer fun and entertainment for both the old and the young. It is located in Siteler District and offers a variety of slides, wave pool, bowling, mini golf, bars, and restaurants. You cannot visit Marmaris without going to one of these water parks. However, remember to include other activities in your trip because all the fun may entice you to go to water parks every day. Marmaris Dolphin Park is ideally a rehabilitation centre for children with disabilities. However, it attracts people from all over the world. You can organise for a single or a group swim with the dolphins. The park allows these swims for children above twelve years and from between eight and twelve years but accompanied by an adult. This is a great experience that you should consider having. 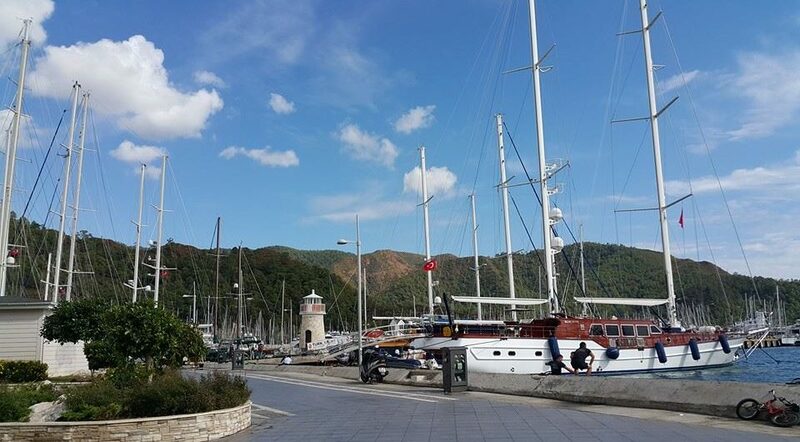 If you like to take scenic walks, the Marmaris Marina is a great place to go. You can have a drink and a snack on the bay and walk along to see the beautiful docked boats and a nice view of the sea. You could also opt to dock your boat if you are coming from a different area. There are many marinas to choose from when it comes to docking your boat. The good thing about a visit to the marina is that it will only take a short time and can comfortably fit into your schedule if you are not in Marmaris for a very long time. Marmaris is rich in historical sites that you should visit on your vacation. Havsa Sultan Caravanserai was built in 1545 and is a magnificent Ottoman structure. It has one big room and seven smaller rooms and is now used to serve the souvenir shops as it is a beautiful tourist attraction. It is located by the narrow street leading to the castle. Another site to behold would be the IbrahimAga Mosque. In Kimeralti district lies this historical preserve showcasing great architecture which was built in 1789. You should also visit the Tomb of Sariana. Built in the Ottoman style as well, this tomb was built in Memory of Sariana who used to give prophecies. It is located on the north east slopes of Marmaris. The Park of Archeology in Lyilik Rocks is also a site to visit. The park is in central Marmaris preserve of the 4th century BC archaeological ruins. Tashan and Kemerli (Arched) Bridge should also feature in your stopover. These arched bridges were built in 1552 by Suleyman the Magnificent and are made of stones and bricks. Other places to visit would be Marmaris Old Town and Grand Bazaar. This place still serves as a bazaar and a marketplace. In the spirit of old things, you can consider visiting Amos Bay and Ruins which overlook Kumlubuk bay and which can be accessed by Asarick Hills. One of the general rules about travelling is that you have to visit museums in the area. You will be pleased to discover that Museums in Marmaris have a lot to offer. Marmaris Museum in Marmaris Castle is located on the hills behind Marmaris Marina. You can see artefacts from the Roman, Hellenistic and Byanzanite periods at the museum. The Marmaris Halici Ahmet Urkay Museum, on the other hand, is a private museum catering to archaeology and ethnography. It houses earthenware, coins, weapons, glassware, ornaments and sculptures of archaeological pieces belonging to different time periods. These are the two museums in Marmaris, and they preserve a world of knowledge about different time periods. One of the main reasons for visiting an island resort is to enjoy sun and sand on beautiful beaches. 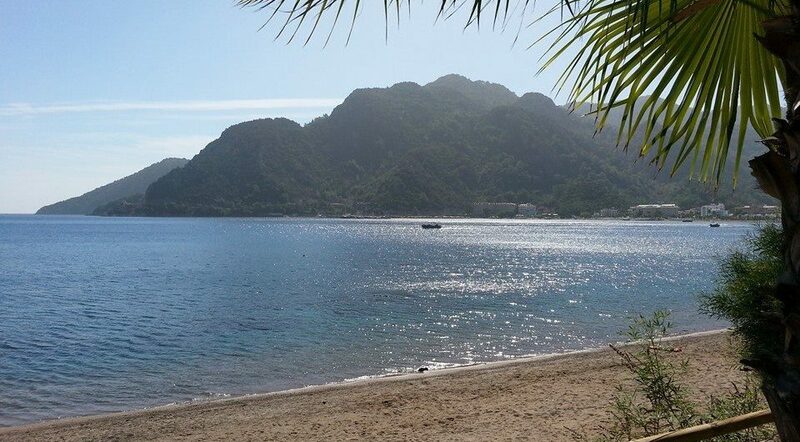 Marmaris beaches also offer this allure and should be fully taken advantage of during your vacation. There are many beaches to choose from. Some of these beaches also offer suntan beds to relax on all day, on a first-come first-serve basis. Marmaris Urban Beach is the most popular one as it is conveniently located in central Marmaris. It is, therefore, easy to access at all times. It has clean sand and clear water and is free of charge. In addition to this, the Marmaris Municipality host different events and organisations on the beach during the year. Marmaris Long Beach, also known as Uzunyali Beach is right next to the urban beach. There are bars, restaurants, cafes and shops that sell sunglasses and sandals among other things. The beach is perfect from April through to November. It stretches ten kilometres all the way to Icmeler Beach which has fine golden sand. This beach stretches six kilometres and offers skiing, banana boats, parasols and parasailing among other things. The beach is cleaned at night to ensure that it is always suitable for relaxation through the day. Turunc Beach is on the West of Marmaris. It offers calm sea and a beautiful landscape as it is nestled between forest hills. While there are many tourists at any given time, the beach offers a serene environment for relaxation and rest. The Cleopatra Island Beach is another beautiful place. It is easily accessible and not overcrowded. It is located 16 kilometres from Marmaris and offers golden sand which is popular with locals and tourists. 28 kilometres away from Marmaris lies Kizkumu Beach. It is one of the most beautiful beaches and most popular with tourists. You should take a walk in the middle of the bay which is tied to a legend. The story goes that a lady who is in love tries to pass by the sea to reach her love by filling her skirt with sand. When she runs out of sand, she drowns. Daylan Iztuzu Beah is another attraction. It is one of the best swimming spots as it is the home to loggerhead turtles. It is open during the day but night visits from 8p.m. to 8a.m. are prohibited from May to September. This is necessary to avoid disturbing the nesting sites of these turtles. There are other beaches than you can also choose to visit including Kumlubuk Beach which is located 6 kilometres away from Turunc, Gunnucek, Ciftlik and Cennet (Paradise) Island Beach. Marmaris Square and Singing Fountains are a great attraction. The square used to have a tall building that housed fast food shops and a supermarket. To restore balance within the community and discourage other developers from copying the building, it was destroyed and replaced by this square which is known as the Youth Square. This square is the favourite place for concerts and events. If you would like to experience the nightlife in Marmaris, then the square should be on your list of places to visit. There are two-night shows for the singing fountains at 9 and 10:30 p.m. The fountains dance along to music and are decorated with light and choreography. Visiting the square can be slotted into a night at a time that coincides with the fountain show. This will ensure that you enjoy the best that metropolitan Marmaris has to offer. You could also check online for any concerts or events that are to be held at the arena during your visit so you can slot one into your schedule. Marmaris Bar Street is a short 500-metre walk from central Marmaris. It is full of clubs, discos, bars, fun, and music. And is the best place to maximise on the nightlife in Marmaris. If you follow the Venice reason during peak season, you will be amazed at the crowds of people having fun. There are also tattoo parlours, ornament and food shops on Bar Street and they are open till late in the night to cater to revellers. Some of the most popular clubs and bars include Rock Bar, Bar-X Cocktail and Dance Bar, Club Arena, Greenhouse Dance Club, Backstreet Disco and Crazy Daisy Bar and Nightclub. You should not miss one of the main Places to See and Visit in Marmaris. What is a vacation if you do not get to experience the culture of the indigenous people? You can experience the culture and meet the local people in rural Marmaris Villages. This tour includes sightseeing and discovering the countryside and village life. The tour includes towns that are nearby Marmaris and usually starts early in the morning and ends at around 5:30 p.m.
Icmeler, located 8 kilometres from Marmaris is one of the most popular accommodation areas. It also has the best coves. Turunc, located 20 kilometres from Marmaris is also a popular one as it is a coastal village with one of the best beaches. 25 kilometres away from Marmaris is Kumlubuk whose hills and coasts have one of the best hiking tracks and ecological tourism opportunities in the world. Hisaronu, Orhaniye, and Bayir are other Marmaris Villages that are included in the tour. You also get to sample the local cuisine as made by the locals in each of these villages. With all the sites to see and places to explore, visiting Marmaris on a budget can be very limiting. There are so many places to see and visit in Marmaris and surroundings. You have to adequately prepare yourself beforehand, save up and book hotels and flights in advance to maximise on your savings. If you travel in a group, this might minimise your expenses and make the trip more memorable as well. However, it is important to note that, at the end of the day, you will probably not be able to see all of what Marmaris has to offer even if you are on a month-long vacation. The trick is to make contacts on your first trip and keep going back. This often helps you get better discounts on subsequent trips. 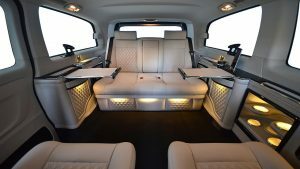 It is paramount that you know all the options that you have before you travel. Divide Marmaris into locations and discover each of the activities and sites that you can get involved in or visit within a given radius. This way, you get places to see and visit in Marmaris and surroundings in the same region. If you are visiting for about two weeks, you can be able to cover two sections if you prioritise your activities. The other convenient option is to hire a tour guide to spend time with you. This helps in navigation and also in learning more about the places you get to visit. Some hotels offer such services. Other hotels have packages that you can pick from. Each is specially designed to include a variety of places to see and visit in Marmaris and surroundings. Blue Cruises from Marmaris provide for a great experience whether you are a local or a visitor, . They are packed with activities and sites to see as you travel along Turkey’s coast. The cruises are on a standard gullet, a wooden boat that is handcrafted after a traditional Turkish design. It takes about a week, that is, 8 days and 7 nights. This is a very popular cruise and you ought to consider adding it on your itinerary if you are going to visit Turkey. The cruise offers endless snorkelling, swimming, windsurfing and fishing opportunities in the Mediterranean’s clear waters. The cruise has its origin in Cevat Sakir Kabaagacli’s exile to Bodrum. He was a political writer who got exiled because of publishing a story about army fugitives. He adopted the lifestyle of the fishermen in the area, going on long excursions on a boat. During this time he discovered the many coves and historical sites in the area. He introduced the fishermen’s lifestyle to intellectuals from Istanbul when they visited. These tours became popular and were known as ‘Mavi Yolculuk’ which translates into ‘Blue Voyage’. The tours became a part of the people for almost 60 years and thus the cruise begun. The gulets are standard. They have double cabins. If you are travelling alone, you still get an individual cabin with a single supplement fee. Each of these cabins has a bathroom, so you do not have to share this facility with any other passenger unless you are travelling together. In addition to this, each gullet provides enough back lounges and space on the deck. There are plenty of sun beds to lay on as you get a tan and enjoy the beautiful view of blue and green waters on the Mediterranean Sea. For the cruise, you enjoy meals, that is, breakfast, afternoon teas, coffee, and dinner. You also get accommodation with standard services such as towels and linens among others. In addition to this, the package includes harbour and port procedures and a transit log. The cruise, however, does not cater for fees to the various historical and cultural sites. The departure point is Marmaris. For a week full of the intricate balance between life on land and sea, you get to dock in different ports and harbours. During this time, you can choose to stretch your legs by visiting the different cultural and historical sites. You can also visit markets to purchase the items that you want, including souvenirs. You get to travel to various villages that are along the Mediterranean Sea’s southern coastline. The route of the blue cruises from Marmaris includes travel to Fethiye, Gocek and Marmaris towns. During these visits, there is enough time to fill your visit with many activities. You could visit the different historical sites. There are many options to choose from. There are a number of waterparks to choose from in Marmaris. If you are travelling with children, this could be a nice activity to fill your entire day. You could also enjoy a swim or some excitement on the different slides for adults within the water parks. You would be able to have some snacks within the park instead of going back to the cruise gullet for your lunch time meals. Marmaris also has a rich history. Fethiye Town, on the other hand, is home to the beautiful Butterfly Valley, Gemiler Island, and Calis Beach, among other tourist attractions. The old town offers a plethora of sites to visit and take photos of in addition to these two, there is Gocek Town. This town provides clear blue waters for a swim. There are many coves and scattered ruins that you can visit in the span of a day. Caunos port has impressive ruins. It was originally a part of the Carian Empire and thus has rich historical significance. You can enjoy this by visiting the museum. You could also opt to visit the private beach of Cleopatra, the Rock Tombs of Kaunos and the Myria Rock Tombs. You can never run out of sites and locations to visit. More options could lead you to Baba Island where there are sandy beaches. Get a tan, swim and relax. If you want to get a mud bath, you can experience this at Cleopatra’s Mud Bath. With this option you get to kill two birds with one stone: see a historical site and get some needed minerals for your skin to glow. Manastir Bay, used as a harbour in Byzantian times is now a natural protected bay that you can visit. The turtle beach is also a great location. It is beautiful and provides breeding ground for turtles. For every location that the gulet docks, it is advisable to visit the areas which are closer to the harbour or port? This is because of ease of access and also reducing the likelihood that you will lose your way and have a hard time finding your way back. You are better placed travelling far if you are travelling as a group. However, you can always seek advice of the best spots to visit from staff members on the blue cruises from Marmaris. You do not have to leave the gulet whenever you dock. You might just want a relaxing cruise that provides you with a spectacular view of the sea. There is enough space on the deck and on back lounges to keep you comfortable. However, you get to make the most of the trip by visiting the various villages. The cruise allows you to spend a lot of time in these villages without having to use the road as these towns are kilometres apart. It also allows you to access different beaches, which would otherwise be accessed by hiring a boat after you have travelled via road. The Blue Cruises from Marmaris are therefore the best of both worlds. Once you dock at the final destination and embark from the gulet, you will have had sun, fun, and relaxation. You can go back to your normal life with nostalgic memories of Turkey’s beautiful coastline.